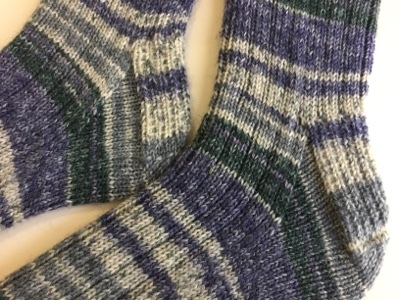 I finished Annie's socks a few weeks back but didn't block them and didn't get a picture. Well here we go. After a few crazy weeks I have a finished knit! 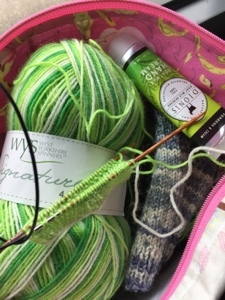 Recently I got side tracked by Bridget's Mojito socks. I was so smitten, I started a pair of my own. Clare was kind enough to gift me this yarn after her last trip to visit the family in the UK. I went with the blueberry waffle because I've been dying to give it a try. It's delivering the fun. My neighbor's baby was about 7 weeks early so I really must get on that baby cardigan. Time to put away the mojitos for a bit. In other news, I did not get the new position I applied to. I knew it was a long shot. But I think I'm still a little unsettled in how it has left me feeling -- funny how that works. I think I'll use my summer as a chance to reassess my priorities. I'm not despondent or anything, but I feel much like that weird parenting emotion where you hope your child will do something without being told and yet ... they don't. Disappointed but not surprised? Slightly irritated, but not dramatic? On the family front, I'm down to ONE more soccer match for the season. A reschedule from April? I can't remember, anyways. I have enjoyed watching The Kid run around and improve this season, but being team Mommanager has been a little stressful this spring. I'm looking forward to a break. The Kid had his last day of school on Thursday. It was bittersweet. I keep having these dreams of him when he was smaller. I dream his small voice saying, "Mama! looking for me in the apartment as if it were a huge mansion. Anyways things are always shifting. Still trying to keep things somewhat tidy. Still trying to not yell so much. Still looking for another hour to knit. Still trying to sleep more. What are you trying to do these days? Next post will be cooking and baking adventures, till I have some more knitting to share! 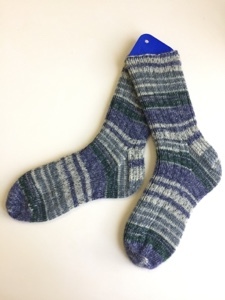 I'm planning on finishing up that new pair of socks for my friend Annie this weekend. I did return the repaired pair to her because I was so excited to have actually pulled that off. I have lost the ball band on this yarn, but it's a bit thicker than my usual stuff. It's sturdy and will be good for her padding around her big kitchen with a cup of tea and a laptop going and fresh granola baking. (Yeah, she's that kind of lady. Her 3 kids have a hot breakfast every morning and remind me to tell you how we met over her Martha Stewart Syle Homemade Kale chips some day ...). Anyways. I love my double point needles for sock knitting. 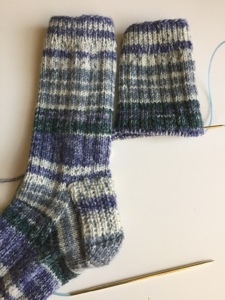 I like how they prop up the sock as if it's shaping up around an invisible leg, but I have had a hard time NOT knitting socks with the circulars these days. It feels faster. Also I feel like I'm constantly shoving my knitting inside a bag in a hurry and I seem to lose less stitches with the circulars. I know I have some point protectors ... somewhere, but that is the problem; they are somewhere, but where, I do not know. 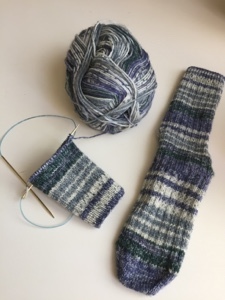 I'm feeling really monogamous now so I'm pretty sure I will finish off this pair of socks before I cast on for a Gramps cardigan. Very truthfully, I really need to organize my knitting gear. I love my stuff, but it's a hot mess right now. How's your knitting gear? Did you manage a spring clean?